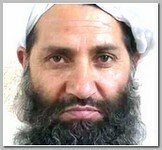 The Afghan Taliban have named, on Wednesday 05/25/2016, Mawlawi (religious title) Haibatullah Akhundzada, probably in his late 50s’, their new leader, a spokesman said in a statement on Wednesday that gave the group’s first official confirmation that former leader Mullah Akhtar Mansoor had been killed in a U.S. UAV strike on 05/20/2016 . Haibatullah Akhundzada did judicial work between 1996 and 2001, the period of Taliban rule in Afghanistan, and following the group’s fall from power in late 2001 (Operation Absolute Justice) he worked as Taliban Chief Justice, according to Afghan sources. Haibatullah Akhundzada is a former head of the Taliban’s judiciary, a senior member of the Quetta Shura and was deputy to Mansoor. Sirajuddin Haqqani , head of a network blamed for many high-profile bombs attacks in Kabul in recent years, and Mullah Mohammad Yaqoob, son of former leader Mullah Omar, will serve as deputies, Zabiullah Mujahid , the Taliban’s main spokesman, said in the statement. The Taliban is the most powerful anti-government group in Afghanistan, where an estimated 11,000 civilians were killed or wounded and 5,500 government troops and police officers died last year alone. Haibatullah Akhundzada is from Kandahar, from the Noorzai tribe. a strong tribe among the Taliban leadership. All these things are signals that he might be able to unite the Taliban. That looks like one of the reasons they didn’t choose Sirajuddin Haqqani as the leader. The new Taliban leader is known to be ‘a Stone Age mullah’ who strongly believes in the Taliban,” Sami Yousafzai, an Afghan expert who has met both the late Mansoor and Akhunzada several times, told reporters . A Taliban source, speaking on condition of anonymity, said the Taliban under Akhundzada has pledged to take revenge against foreign forces and the Afghan government for Mansoor’s killing.